A digital version will also be available on all DSP’s. Pre-order Ashes Of The Wake – 15thAnniversary Edition now via https://legacyrecordings.lnk.to/AshesOfTheWake15. 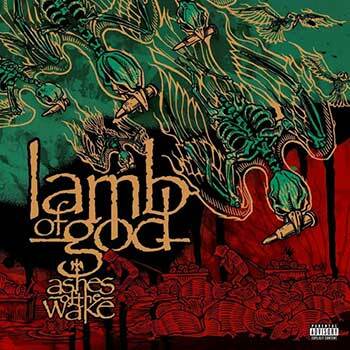 Guitarist Mark Morton states, “This year, LAMB OF GOD will celebrate the 15th anniversary of the release of our third studio album, Ashes Of The Wake. As I recall that moment in time, it was a pivotal point for our band. We were transitioning from the relative comfort of an underground scene that we felt confident and natural in, to a much higher profile with higher stakes and more critical eyes upon us. It was our first release on a major label and our first to be aggressively marketed through mainstream channels. I remember feeling a mixture of pressure and confidence, along with a pervasive uncertainty as to whether our brand of bottled insanity would translate to a larger audience. Ultimately, I think our biggest strength in that situation was that we never let pressure, expectation or the potential for failure affect our creative process. We stepped up our collective focus and concentration to rise to the occasion, but we stuck together and stayed true to our identity, artistically and otherwise. That tunnel vision approach to our creative process is part of our DNA as a band. I believe it’s a large part of what keeps us honest and motivated to this day.